Android game My Hospital by Cherrypick Games is one that looks a lot like Theme Hospital (very old PC game) and a more recent Fun Hospital android game. Similar to Fun Hospital, the game starts with the construction of various offices. The look and feel is very similar to Fun Hospital. Both have fun graphics, but that's where the two games are different. The gameplay of My Hospital is much more focused on creation of the medicine. So even though you're in charge of laying out the floor plan for your hospital, 95% of the game is optimizing the creation of medication. This means creating medicine A, medicine B, and medicine C from base material. But as the game progresses, be prepared to combine medicine A and medicine B to create medicine D. Unfortunately, I don't have the spare brain power to dedicate to remembering all various combinations, so this wasn't the game for me. In this game, there are an unlimited number of patients. The moment one patient is cured, its 100% guaranteed that another patient will arrive to take his/her place. That being said, the primary point of the game is the keep a steady production of medicine. Unfortunately for me, this become old fairly quickly. The one hook the My Hospital has is the various new "features" of the game that are unlocked at various levels. From side games like the VIP Ward, Kids Waiting Room, Anti-Epidemic Center, and Medicinal Garden. Though I never got far enough into the game to discover what these rooms do, they do pique my interest and subtly urge me to want to continue playing. If it's taking too long to progress, there's always the options of in-game purchases to progress through the game. You can take it social and get your Facebook friends also playing the My Hospital to help you out by selling you items you might need in a crunch. I however, wasn't a player looking to spend money. Keep Panacea Collector Upgraded - This is the base ingredient for all your medication, and this machine will create it for you free of charge. Each upgrade increases both it's storage and refill rate! And upgrades are instant. Ignore Decorations - From what I can tell, decorations do nothing except provide you eye candy for the game. No matter how many patients you have, they'll never leave because they don't have places to sit or anything. Decorations really aren't the point of My Hospital. At the end of the day, I recommend Fun Hospital over My Hospital. To be honest, I tried this game because the My Hospital screenshots reminded me of Fun Hospital and I was interested in another take on the game. Instead, what I got was a carbon copy of many other Android games that require "building" based on certain combination "ingredients". I do like it at first, but the moment the combinations get too complicated, the game drags on and boring. 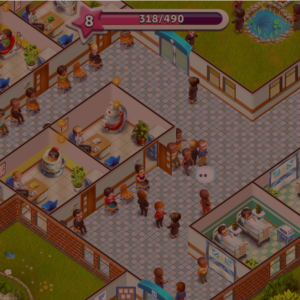 Head over to my review of another Android game Fun Hospital and how it's very similar to an oldschool PC game called Theme Hospital.